When you first started using your e-mail program, your inbox may have seemed like a convenient and hassle-free storage bin for all of your incoming messages. But hundreds or thousands of messages later, you’re probably finding the task of managing all of those messages rather unwieldy. It’s never too late to change your habits and find a more efficient way to handle the constant stream of e-mail that arrives in your inbox. Yesterday, I offered suggestions for decreasing the stream of incoming e-mail messages. The next step in the cleanup process is to create a simple filing system and to automate as much of the process as possible. When you originally set up your e-mail program, it probably provided just a single mailbox—your inbox—for all incoming messages (plus others for sent messages, drafts, trash, and junk mail). But when everything is in one mailbox, it’s hard to keep track of what you’ve dealt with and what still needs your attention. So the first step to imposing order on your e-mail is to create additional mailboxes. This will give your mail a place to go besides your inbox. I’ll explain how you’ll use each one of these in more detail as we go along. Briefly, Filed is for everything you’re finished with but want to keep for reference; Action is for messages that require you to do something with them before they can be filed or deleted, such as replying or forwarding; and Later is for low-priority messages you want to look at only when you have free time. To create a new mailbox in Mail, choose Mailbox: New Mailbox. From the Location pop-up menu, select where the mailbox should reside. If you have an IMAP, .Mac, or Exchange account, select it from this menu to store your mailboxes on the server. This makes them available when you access your account from other computers or with other e-mail programs. Otherwise, select On My Mac to store them locally. Type a name, and click on OK. Mail arranges mailboxes alphabetically within each account; however, you can drag the account itself toward the top of your mailbox list for quicker access if you prefer. From now on, your inbox will be just that: a place where incoming messages stay just long enough for you to decide what to do with them. For the moment, don’t worry about the hundreds or thousands of old messages already there—we’ll deal with those shortly. Right now your objective is to get every new message out of your inbox within a few minutes. Create a Task If a message contains an assignment or references some action you must take other than merely replying—write an article, look up information, make an appointment, or whatever—add an item to your to-do list, and then file the message immediately. Your inbox shouldn’t serve as a makeshift to-do list, or else you’ll guarantee that it’s always full of tasks that take days, weeks, or longer to complete. Entourage, Mail 3, and iCal—as well as many third-party programs such as MOApp’s $5 meinKopp and CulturedCode’s $49 Things—include capable task managers that help you stay on top of deadlines and errands. In Mail 3, you can create a to-do item out of any message simply by highlighting some text that represents the task and clicking on the To Do button in the toolbar. 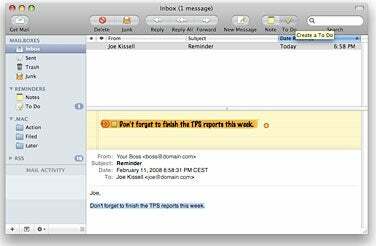 A yellow header appears at the top of the message with your task highlighted. From here you can edit the text, or click on the arrow to the left of the new task to set a priority, due date, or alarm. In Mail, you can turn selected message text into a to-do item, which shows up both in the Reminders section of the mailbox list and in iCal. Mail also adds the new task to its To Do list, which you’ll find under Reminders in the Mailboxes pane; the task appears in iCal as well. (For more advice on managing your to-do lists in Mail, see this month’s edition of Working Mac.) Once you’ve created a to-do item, move the original message to the Filed mailbox in case you need it for future reference. Later you can quickly locate a task’s associated e-mail message by switching to your To Do list and clicking on the gray arrow icon to the right of the task’s title. To create to-do items from messages in Entourage 2008, select a message and choose a due date from the To Do pop-up menu on the toolbar. You can also set an alarm by choosing Add Reminder from the same menu. When you’re done, move the message to your Filed mailbox. 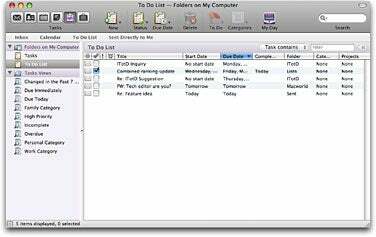 Now, when you click on the Tasks button in the toolbar, you’ll see the message under the To Do List header; in Entourage 2008, to-do items also appear in the My Day application. Entourage 2004 doesn’t offer a To-Do menu, but you can get similar results by selecting a message and choosing Flag For Follow-up from the Flag pop-up menu in the toolbar, and then setting a due date and alarm in the dialog box that appears. In Entourage 2008, messages you've flagged as to-do items show up in your To Do List, as well as in the My Day application. Mark It for Action If the message requires a reply (without involving any separate task), but you don’t have time to deal with it right this minute, move it to your Action mailbox. The point of the Action mailbox isn’t merely to keep your inbox empty, but to focus your attention on those messages that genuinely require more attention than you can give in a few minutes. So be sure to check your Action mailbox at least twice a day, and move messages out of it (into Filed or Trash) once you’ve dealt with them. Make it your goal to keep this mailbox as close to empty as possible. Under no circumstances should you let any message sit there for more than a week. Save It for Later Not every message is a top priority. For messages that you may want to look at, but don’t really need to spend time on now, use the Later mailbox. In fact, you need not even open these messages if you can tell what they are from the sender and subject. When you have some free time, go through your Later mailbox and delete or file those messages as appropriate. Forward Some messages require another person’s action. If you receive a party invitation and need to find out whether your wife is interested before you reply, forward the message to her and then file the original until you receive her response. If you’re concerned that the person to whom you’ve forwarded a message might not get back to you and that you’ll forget about it, still file the message, but either put it in your Action mailbox or flag it so that it appears in your to-do list. In any case, get it out of your inbox. Delete Some messages are clearly worth saving for future reference, but in many cases it’s evident immediately that you’ll never need to look at a message again after reading it once. In these cases, I recommend deleting the message right away. If you keep it around, you’ll waste time by forcing yourself to reread it later to determine whether it’s important.